During Buttigieg's appearance, which came on the same morning he released a video teasing an upcoming event at which its expected he will formally launch his campaign, he was asked about his characterizations of the president as a "chicken hawk" who dodged the Vietnam War draft and whether such attacks had a harmful effect on the nation's political discourse. "I work very hard to make sure that when we oppose this president we're not emulating him," Buttigieg said. "But we do need to call out hypocrisy when we see it and when we have people wrapping themselves in the flag, who evidently faked a disability in order to get out of serving, when you have somebody seeming to want to impose his religion on others as the vice president has, and at the same time teaming up with the presidency that seems to have no regard for, at least, what I would consider to be Christian values, I do think that hypocrisy needs to be called out." "It needs to be called out forcefully," the mayor added. "But we need to be factual and we need to be honest and we do, in resolving all of this disagreement, need to be decent as well." In the video emailed to supporters and posted to his social media channels earlier in the morning, Buttigieg, 37, recounts his efforts to introduce himself and spread his message since his committee’s launch in late January before asking supporters to join him in South Bend on April 14. As he travels the country sharing his platform with voters, the mayor, along with much of the Democratic primary field as a whole, has faced widespread criticism from the Republicans, led by Trump, for embracing ideas like Medicare-for-all and the proposed "Green New Deal," which it claims have roots in socialism. On "GMA," Buttigieg characterized such attacks as misleading. 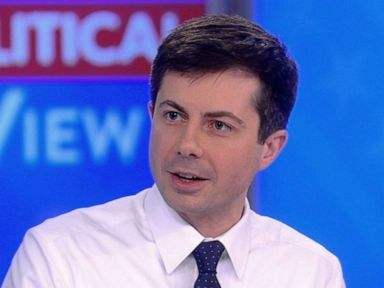 Democratic presidential candidate and mayor of South Bend, Indiana, Pete Buttigieg, talks to the hosts of ABC's "The View," March 22, 2019. "The president is adopting a tactic that takes us back to the darkest days of the '50s when you could use the word 'socialist' to kill somebody's career, or to kill an idea, but that trick has been tried so many times that I think it's losing all meaning," he said, pointing to the right-wing origins of the Affordable Care Act, popularly known as Obamacare, of an example of a proposal on which the GOP flipped. "The Affordable Care Act was a conservative idea that Democrats borrowed and they called that 'socialist.' So it's kind of like the boy who cried wolf," Buttigieg continued. "It's lost all power I think, especially for my generation of voters. Folks just want to know whether an idea is a good idea or not and slapping a label on it, especially in a careless way that doesn't make any sense, I don't think it moves the debate." The mayor further argued, citing polling that on several of the issues with proposed "socialist" solutions, the American public leans further to the left than Congress. "Let's take universal background checks [for the purchase of firearms], 80-90% of Americans think we ought to do it. Over 80% of Republicans think we ought to do it. And congress can't make it happen," he said. "Comprehensive immigration reform, higher wages, paid family leave, even Medicare-for-all, these are things that command a support of the majority of the American people." Mayor Pete Buttigieg talks with an AP reporter at his office in South Bend, Ind., Thursday, Jan. 10, 2019. The interview on "Good Morning America" and the announcement of next week's event coincides with the mayor’s emergence from relative obscurity. He’s parlayed a string of high-profile interviews and appearances into a place among the upper-tier of candidates in the Democratic primary. 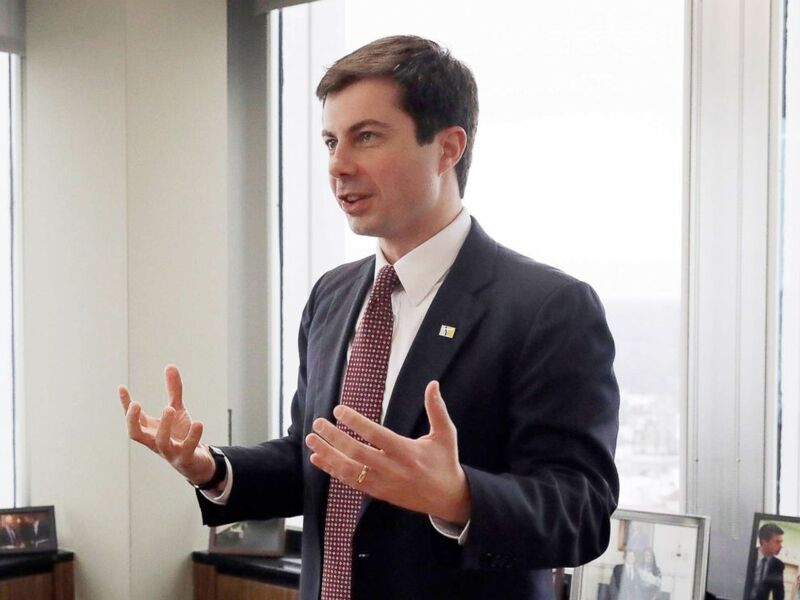 As part of Buttigieg’s pitch to voters, he has argued that as the second-term mayor of South Bend -- Indiana’s fourth-largest city by population and the home to Notre Dame University -- he has more political executive experience than both Trump and Pence had during the 2016 campaign. He has paired his pitch with the notion that American politics are due for a generational shift. “We would be well-served if Washington started to look more like our best-run cities and towns,” Buttigieg said during the CNN town hall and repeated again on "GMA." Additional interviews with Stephen Colbert and on "The Breakfast Club" radio show to start his campaign have led to increased awareness of the mayor, his personal life (Buttigieg is gay, knows multiple languages and speaks openly about his Christian faith) and his packed resume -- prior to earning his Rhodes Scholarship, Buttigieg attended Harvard, and he worked as a consultant for John Kerry's 2004 presidential campaign before enlisting in the Navy Reserve, serving in Afghanistan and moving home to his native South Bend. In his video, Buttigieg further outlines a few of the goals of his potential candidacy, seeking supporters who want to "make our politics more honest," "fix our democracy," "defend racial justice," "look forward to the future" and "bring generations together."